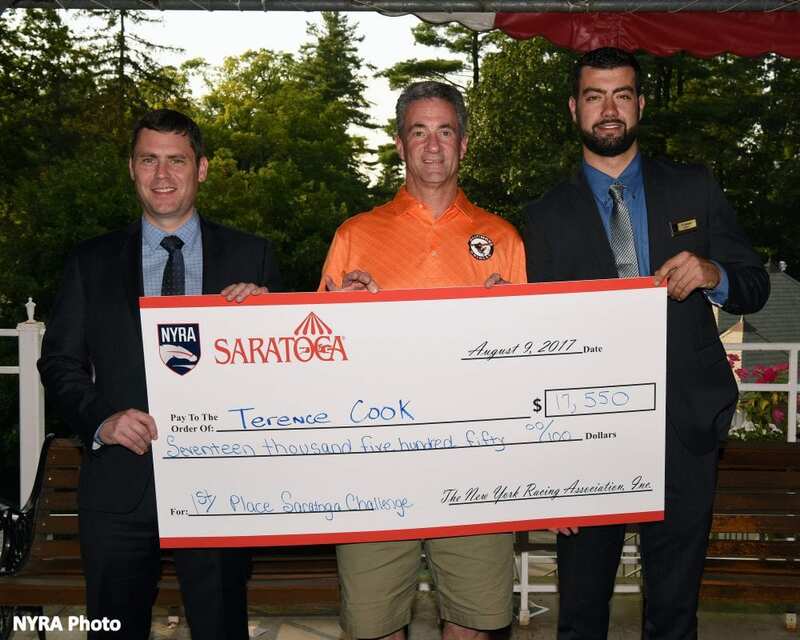 Trailing by more than $1200 in bankroll heading into Wednesday's final race at Saratoga Race Course, Terence “Terry” Cook had a decision to make. Bet big on the 10th Race and try and capture first place, or hold steady and hope his roughly $2000 bankroll lead over third-place would hold up. The Towson, Maryland resident consulted with his partners, Mark Komen, Mark Saperstein and Bob Schmidt and they decided to take a chance, betting $700 to win on Rialto Racing's Fairybrook, and placing a $400 win bet on Ouro Verde. “Myself and my partners we picked two horses in the last race. Went with the 11 [Fairybrook] on the top number and we backed it up with the 1 [Ouro Verde]. We were actually thinking about sitting tight and taking a birth and the money, but ended up, we went for it all,” Cook said. Jockey Jose Ortiz rode Fairybrook to victory paying $8.20 on a $2 win bet. The $2,870 score propelled Cook and his partners ahead of handicap tournament regular Tony Zhou to capture first place with a total bankroll of $6,890 to Zhou's second place bankroll of $6,170. Cook and his partners took home $17,550 and won entry into the 2018 Belmont Stakes Challenge with the win. Zhou wins $8,775 and a seat at the 2017 National Handicapping Championship for finishing second. Finishing third was Chris Dewey with a bankroll of $2707, capturing the 2nd seat at the NHC and $7,020 in cash. The Saratoga Challenge has a $1000 entry fee, with $500 going to the prize pool and the other $500 used as live money for participants to wager. Contestants are required to wager at least $500 and bet on at least five live races exclusively at Saratoga Race Course. On Thursday, there will be an entirely new contest with the same rules and same prize structure. Cook said he is excited to come back tomorrow and see if he can win again. This entry was posted in Horseplayers and tagged Horse Racing, nyra, saratoga challenge, terry cook, thoroughbred by NYRA Press Office. Bookmark the permalink.